Sri Lanka's president went back Wednesday on pledges to investigate war-time atrocities, saying he did not want to "re-open old wounds" but sparked a rift with his cohabitation government. Sri Lankan government troops were accused of killing at least 40,000 ethnic Tamil civilians in the final months of the island's 37-year guerrilla war that ended in May 2009. 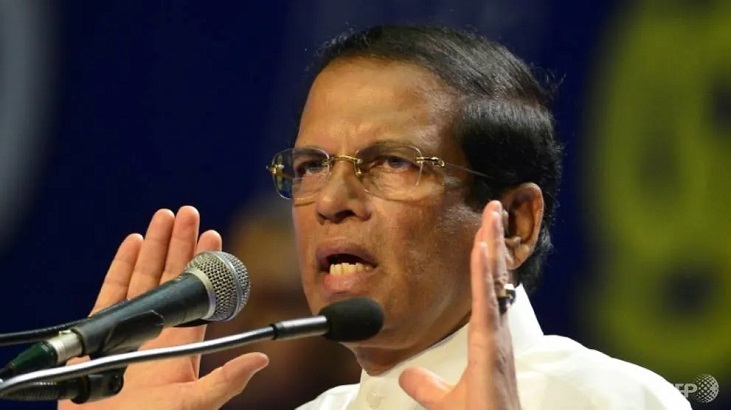 "It is a decade since we have established peace in this country," Sirisena told reporters at his official residence in Colombo. "I want to tell them (the UN) not to pressure us." "What I want to tell them is don't dig the past and re-open old wounds. Let us forget the past and ensure that we all live in peace." Within hours of his remarks, Sirisena's cohabitation government sought to distance itself from his stance and said the administration of Prime Minister Ranil Wickremesinghe will remain engaged with the UN on war crimes. "A further extension of two years through a co-sponsored roll-over resolution accordingly needs to be viewed in this backdrop," the foreign ministry said in a statement. But the Supreme Court held that the president's action was illegal and restored the status quo. "I hope they (the UN) will respond positively," Sirisena said. The Sri Lankan government is set to send its own delegation in addition to the team of Sirisena. Top UN diplomats had expressed concern over "worryingly slow" progress by Colombo. Over 100,000 people were killed in Sri Lanka's 37-year-old Tamil separatist war.